The maximum city Mumbai is unique and unlike any other metropolis in India. The manner in which people of different strata of society have no choice but to interact with each other and have a symbiotic association is a part of the city’s DNA. DELHI BELLY writer Akshat Verma’s directorial debut KAALAKAANDI attempts to throw light on this aspect of Mumbai but in a quirky way. So does it manage to entertain or prove to be a disappointment? Let’s analyse. 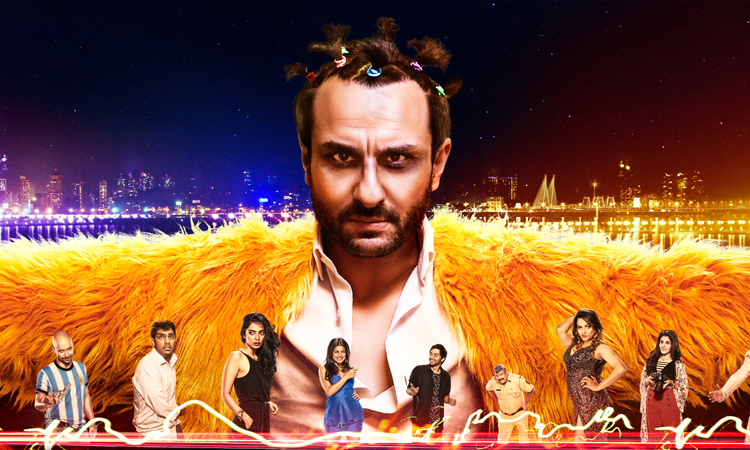 KAALAKAANDI is the story of how people from diverse backgrounds converge in one maddening night in Mumbai. Rileen (Saif Ali Khan) finds out that he’s suffering from stomach cancer and that he has only a few days to live. Tara (Sobhita Dhulipala) is dating Zubin (Kunaal Roy Kapur) and has a flight to catch. She goes to meet Ayesha (Shenaz Treasury) as it’s her birthday. They meet in a club and sadly there is a raid by cops. Tara realises that she’ll get late for the flight thanks to the raid and subsequent investigation and makes a daring plan to escape. Waris (Deepak Dobriyal) and Amjad (Vijay Raaz) work for the dreaded gangster Raza (Asif Basra). They make a plan to get rich overnight by deceiving Raza. Angad (Akshay Oberoi) is Rileen's brother who is getting married the same night to Neha (Amyra Dastur). He gets a call from his ex-girlfriend Selina (Amanda Rosario). She tells him that she is in Mumbai and wants to meet him immediately. Angad immediately agrees. How all these tracks make an impact on the lives of the characters that night forms the rest of the film. KAALAKAANDI's first half is quite interesting and funny. The characters are introduced neatly and director Akshat Verma handles the multiple tracks well. Saif Ali Khan's track takes the cake as it’s hilarious and brings the house down. The manner in which he starts hallucinating is very well done. Shockingly things go downhill thereafter. The film stops being funny and gets boring. Tara-Zubin's track ends on a sweet note but this is not something we expect in such a film. Waris-Amjad's track goes out of control and difficult to comprehend especially the way it ends. Akshat Verma’s story is promising to an extent but then goes haywire. The plot had the potential to be the next 99, SHOR IN THE CITY and even DELHI BELLY but sadly the writer fails to do so. Akshat Verma’s screenplay is engaging till the first half but then doesn’t engross. Akshat Verma’s dialogues are funny and witty, especially the ones mouthed by Saif Ali Khan and Shenaz Treasury. Akshat Verma’s direction is fine for a debutant. But with such a poor script, there’s little he could do to salvage. Saif Ali Khan is the best thing about the film. He delivers a crazy performance and it turns out to be the sole novelty factor about the film. Akshay Oberoi is sincere and gives a decent performance. Sobhita Dhulipala handles her difficult part quite well. Kunaal Roy Kapur is fair and raises laughs in his entry sequence. Deepak Dobriyal gets to shine but Vijay Raaz doesn’t get much scope. Shenaz Treasury is hot and raises laughs. Shivam Patil (Jehangir) leaves a mark in the Emraan Hashmi sequence. Nary Singh (Sheila) is quite an endearing character and does very well. Amyra Dastur is cute but is hardly there. Asif Basra is menacing. Neil Bhoopalam (Ustad) plays a unique character, unlike anything he has done in the past but has limited screen time. Isha Talwar (Rakhi) gives a good performance but one wonders why she is clicking pictures all the time. Sameer Uddin's music is nothing great. ‘Swagpur Ka Chaudhary' is slightly memorable while ‘Kaala Doreya' is forgettable. Background score however is funky. Himman Dhamija's cinematography is neat. Nidhi Rungta's production design is authentic. Shan Mohammed's editing should have been slicker. VFX is terrific, especially in the scenes where Saif is hallucinating. On the whole, KAALAKAANDI has a promising first half but goes completely downhill. At the box office, it has slim chances of becoming commercially successful.